Does the world really need any more landscape paintings? If by that one means more of the work where the default setting is best described as "sweet", "restful" or "softly flowing" I'd say probably not. Reality has a sharp edge. It cuts though our outworn habits. When I'm painting I often hear the phrase "Nature has teeth"whispering in my ear. What I mean is that in finding her real beauty I'm going to discover something that comes with a jarring, a slightly unsettling surprise. Each generation sees a little differently than the one that went before. We need somebody to look hard at the world with eyes unencumbered by outworn blinders and expectations of just the predictable, The earth has a pulsing energy that always lies just a bit hidden from our view. For me working directly from nature has become my key tool- sort of like magnetic compass- to lead me toward the best of the unexpected that's out there. I'm just back from a week long painting trip in the Adirondack Mountains of northernmost New York State. These days when I work outside I usually draw in vine charcoal instead of painting in oil. What I'm after is the space, the light, and the specific shapes of the locale. So I go out with one of my portable easels to make "working drawings", pieces that may serve down the road as a basis for an oil painting, perhaps a very large one. I work in vine charcoal as it helps me pare down the overwhelming complexity of the landscape into a few elemental forms. Its soft and always-ready-to-smear black dust forces a selective eye on you. It makes you radical, cutting out all but the shapes that pack the biggest expressive punch. 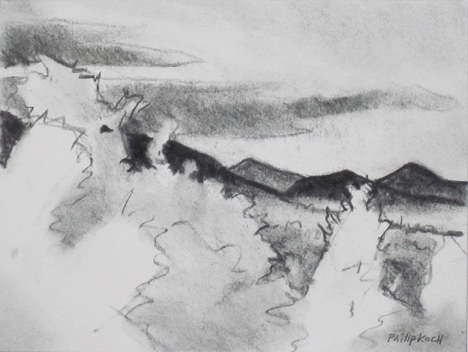 Above is a 9 x 12" as yet untitled drawing from the town of Lake Placid looking west. My goal was to leave foreground very light and play that off against a middle and far distance where the forms have been pushed darker than in real life. The foreground is held to basically two overlapping white and then off-white "stage flats" of foliage. While more detail could have been added to those trees in front, I was afraid it would allow them to drift into darker tones, lessening their difference from the more distant spaces. 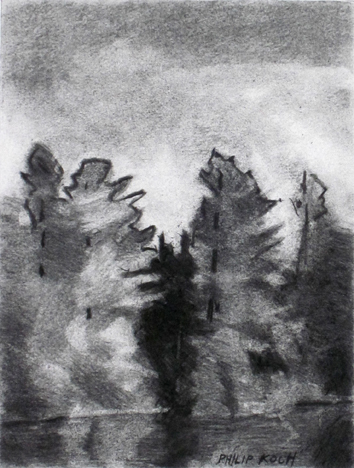 So too above in this drawing of trees along the shore of Lake Placid itself (the town of Lake Placid is actually located on the adjoining Mirror Lake, just to confuse people). Here a shadowed interval wedged between two taller stands of trees is pushed far darker than in real life. At the tops of those tallest trees I've resorted to heavily outlining the silhouettes to keep their harsh, jagged rhythm clear against the sky. To resort to more detail of the finer branches and leaves here, on such a small scale drawing (12 x 9") would have diluted the impact of the drawing. 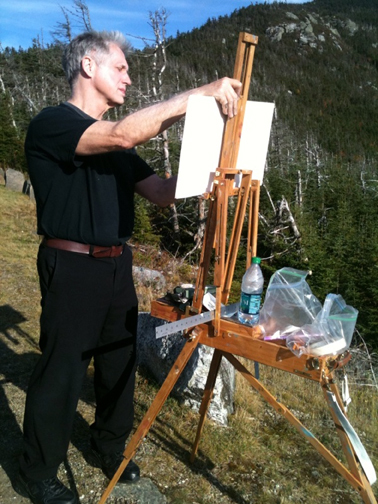 Here below is our hard working artist a few hundred feet below the summit of Whiteface Mountain working on another drawing. A lesser artist would have taken advantage of the convenient toll road that winds its way to the mountain top, but of course I shunned such inauthenticity and backpacked my way up the 3000' rise to gain the perfect view. Ironically I ended up right next to the aforementioned roadway. With me is a "half box" french easel, some foam core boards to hold some cut-down sheets of Rives BFK etching paper (a terrific surface for charcoal drawing), my carpenter's square to measure out even rectangles on the paper, assorted erasers, a soft leather chamois skin for blending the charcoal, masking tape, soft vine charcoal sticks, and ziplock plastic bags to hold everything. Oh and if it's hot, water. And here below is one of the small drawings I was working on in the above photo, a closeup selection of the wild ins and outs made by the irregular islands that largely fill up Lake Placid. Such odd but endearing shapes- things like this I could never just think up. I need to find it out in the weirdness of nature. Wonderful description of your process Philip and so nice to see the drawings. Most of my field work these days is also drawing. I've just started teaching my class Field Sketching for Landscape Painters this week and have 17 students tackling Nature in pencil and charcoal! Is it best to dress all in black when working in vine charcoal? 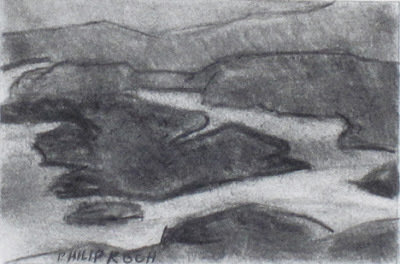 Philip - Not sure why, but at this stage of your approach in this blog, I get a feel of John Marin's end product - places and spaces that always seem so new - where a great deal of courage is needed to convey so much with so little - where early content and easy complacency with "sweet", "restful" or "softly flowing" might, perhaps begrudgingly, eventually give way. Another inpsiration.